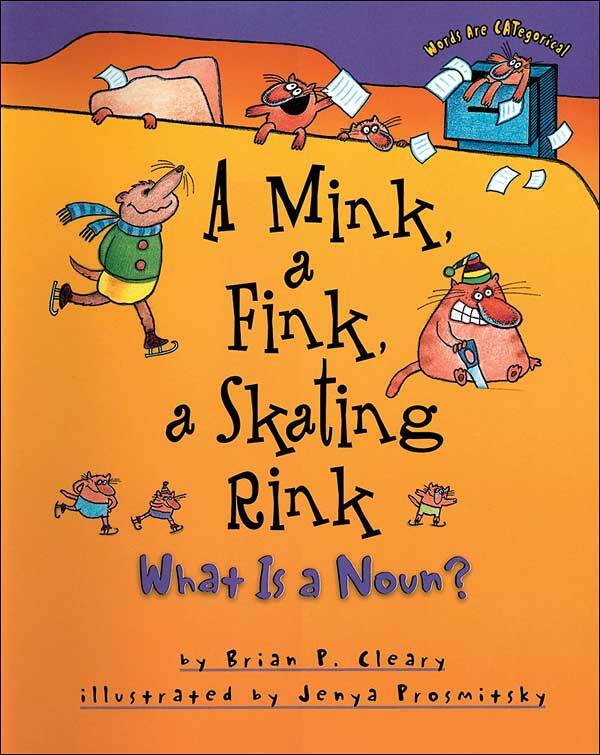 A Mink, a Fink, a Skating Rink uses "cadences reminiscent of jump-rope songs" (Publisher's Weekly) to define nouns and provide many examples, with each noun in bold, colored type to make it stand out. There is no overarching storyline; instead, what ties it all together is the continuity of the illustrations, which depict cats in various madcap scenes. 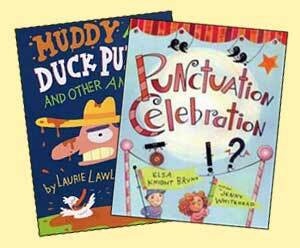 This is one of those popular series that reminds teachers that books need to first and foremost appeal to kids! The cartoon illustrations aren't the usual ones that I am drawn to, but they certainly do appeal to kids. One note: Not much ink is devoted to talking about nouns. 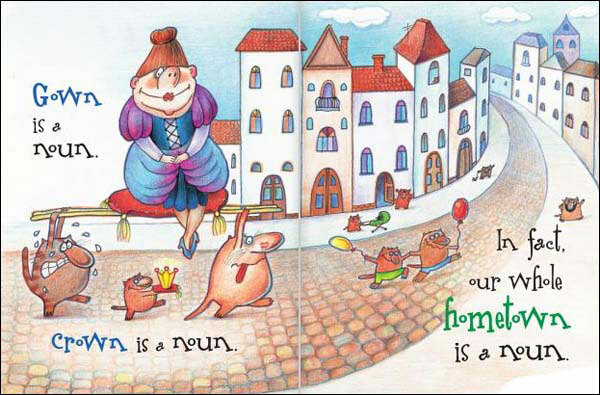 Instead, this book is devoted primarily to providing examples of nouns. In their review of this book, Publisher's Weekly was right on the mark when they said that while this book is "certainly one of the least serious grammar lessons imaginable, this book will convince kids that nouns are everywhere." Kids can generally read books on this reading level about mid-third grade (very general statement, of course), so this book might need to be read aloud to second graders OR third graders at the beginning of the year. However, most fourth graders should be able to read this book. Below are sample spreads from inside this book. 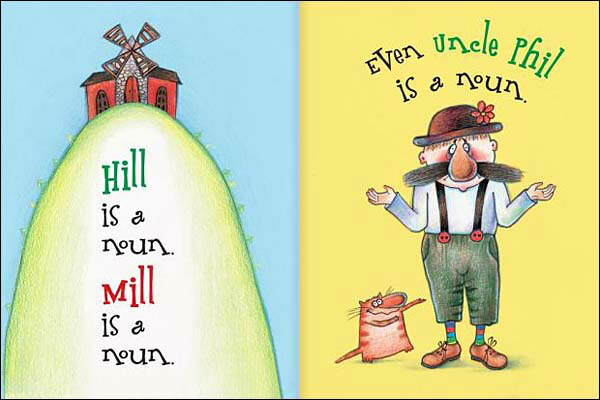 Like most pages in this book, these pages focus on providing examples of nouns--with nouns printed in a different color to make them stand out. If you recognize the zany cats, you've probably seen a book from this popular series before. 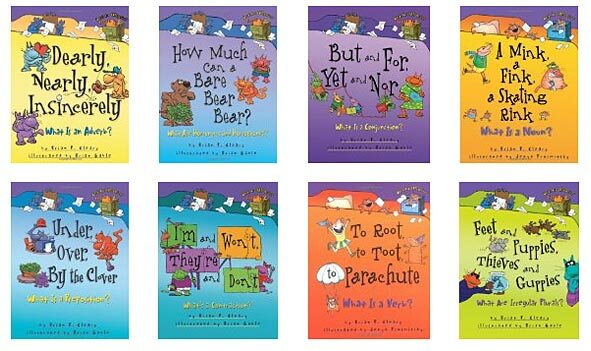 Called Words are CATegorical, this series has books on a range of language arts topics like parts of speech, figurative language, etc.